Cook granulated sugar, coffee and water in saucepan on medium-low heat 2 to 3 min. or until sugar is dissolved, stirring constantly. (Do not boil.) Remove pan from heat. Add dark chocolate; stir until melted. Whisk 2 egg yolks and vanilla in medium bowl until blended; gradually stir in dark chocolate mixture. Beat 5 egg whites with mixer on high speed until stiff peaks form. Combine cocoa powder, flour and baking powder; stir into dark chocolate mixture until blended. Stir small amount of egg whites into chocolate mixture, then gently fold remaining egg whites into chocolate mixture just until blended. Transfer to 9-inch springform pan sprayed lightly with cooking spray; spread gently to form even layer. 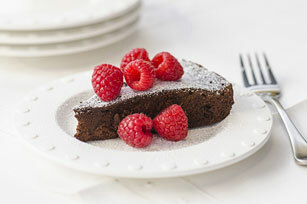 Sprinkle with icing sugar just before serving; top with raspberries. Substitute any other fresh fruit, such as strawberries, orange slices or mango slices for the raspberries. This scrumptious chocolate cake, which is sure to delight both family and friends, can be part of a healthful eating plan.